Audi has hinted that the next-generation A3 could be offered with a fully electric drivetrain in 2020, as it aims for one in three customers to buy electrified models by the middle of the next decade. Speaking at the company’s Annual General Meeting, Prof. Rupert Stadler, Chairman of the Board of Management of AUDI AG confirmed three electric models by the end of the decade. The ‘e-tron’ will be an SUV with a 310-mile range, arriving in 2018, and it will be followed by the e-tron Sportback (pictured) a year later. Stadler also said the Audi would launch a ‘premium electric car in the compact segment’ in 2020, based on the Volkswagen Group’s modular EV technology platform. This would coincide with the likely launch of the next A3 line-up, following a seven-year model replacement cycle. However, it’s likely that much of the brand’s planned electrified sales will be plug-in hybrids. 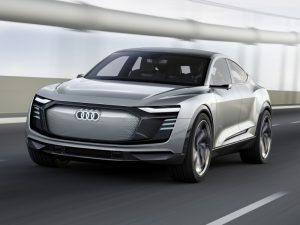 Audi will add an ‘electric version’ to each of its product lines, while steadily reducing internal combustion engine versions to free up resources, and is co-operating with Porsche to reduce unit costs. “By the middle of the next decade, every third Audi delivered to a customer will be either partially or fully electric. That means we will make the models we offer so attractive that at least one in three customers will make the change,” Stadler said.